Stems: Erect or ascending, prostrate with age, several, simple or sparingly branched. Leaves: Basal leaves with stalks to 2.8 inches long, stem leaves shorter-stalked to sessile; oblong to oblong-ovate, 1.2 to 3.6 inches long, pinnate, green or waxy, glabrous; primary segments 5-11, these pinnately-divided, again incised; ultimate segments elliptic to egg-shaped. Inflorescences: Raceme, 8-20-flowered, surpassing leaves; bracts conspicuous, ovate, mostly 2/5 to 3/4 inch long, 1/6 to 1/4 inch wide, reduced upward, tapering to points. Flowers: Sepals 2, ovate, less than 1/20 inch long, variously toothed; petals 4, in 2 series, bright yellow; spurred petal 3/5 to 3/4 inch long; hood crested; crest well-developed, conspicuous; spur about 1/3 inch long, tip nearly spherical; spurless petal 1/2 to 3/5 inch long, bent, basal portion claw-like, crest similar to spurred petal; inner petals oblanceolate, about 3/5 inch long; stamens 6, arranged in 2 sets. Fruits: Capsule, erect, incurved, .8 to 1.2 inches long; seeds circular, black, shiny, finely roughened (under magnification). 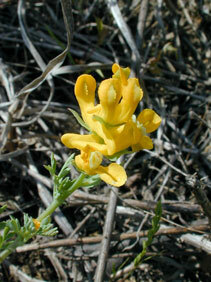 Habitat: Open areas, prairies, hillsides, alluvial plains, disturbed sites; sandy soils. Distribution: South 3/4 of west 2/3 of Kansas.